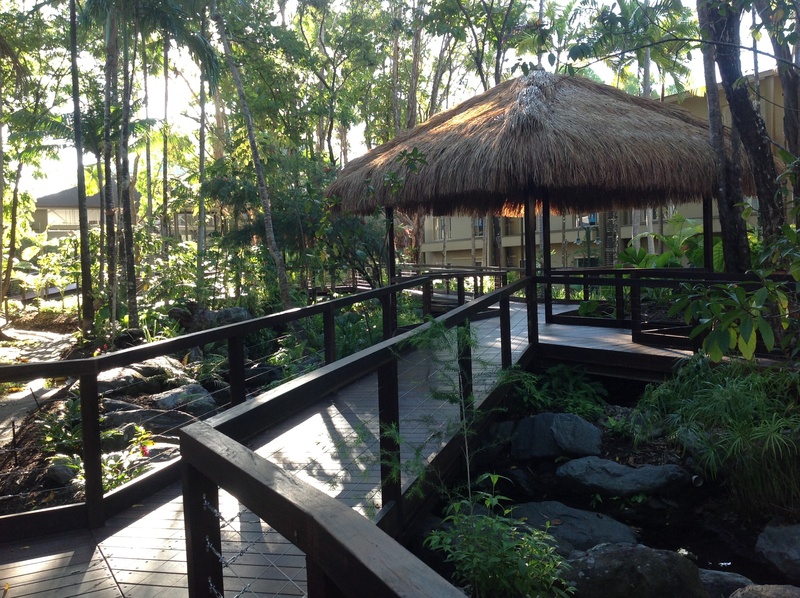 So our day started at 5.30am getting up & getting the kids ready to start our adventure of being the Port Douglas Resort Reporter for Wyndham. We were all pretty excited. I won’t bore you with the details of the trip up here, but it was actually very good. We travelled with Virgin Australia and after a few gate changes and a slightly delayed take off, we made it to Cairns just after 12noon. The kids were great on the plane (ages 6, 6, 3) – we brought quite a few activities & snacks to entertain them with, so it was pretty easy. And it’s not a long flight anyway. Our hire car with Europcar was ready and the drive to Port Douglas from Cairns Airport is just 1 hour along a beautiful coast. 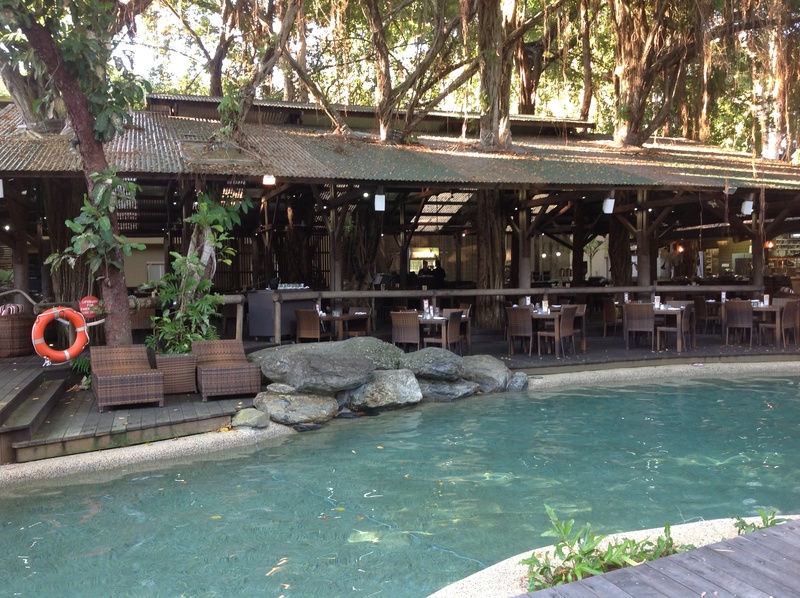 We decided to go straight into town to get some groceries for the week – but after a stop to treat ourselves at the local pub for a late lunch at the Central Hotel Port Douglas. The main street in town is quite long & just seems to be buzzing with activity on a Winter’s day. Mind you, Winter here is a beautiful 28 degrees – perfect for me. Like I expected, it is a friendly place. 10 minutes after we’d sat out the front of the Central we met some other tourists, then more friendly people in Coles supermarket. It’s such a comfortable town & there’s a lot of shops here that have everything you need for a holiday. 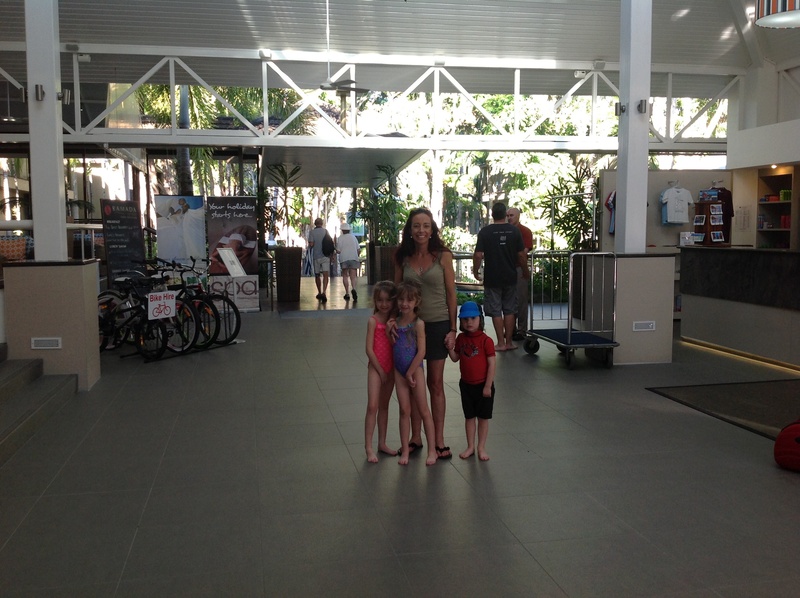 We finally arrived at Wyndham Resort – The Ramada – around 3.30pm. Arriving at a Worldmark resort for my family & I is always exciting. We know the 5 star standard & what to expect at check in – happy & helpful staff. Today was no different. Our first impression of the resort was WOW! I felt like we were in Fiji. The reception is open, tropical & just stunning with comfortable lounges everywhere & a fish pond to entertain the kids while you check in. It’s a resort I’m going to be extremely sad to leave – and I’ve only been here 1 afternoon. I was greeted by Jess with a big friendly smile and “hi darling” and a handshake like we’d met before. Mal also helped at check in, another happy Worldmark staff member. It makes arriving here so much better than other hotels, it’s like your old friends. Our room was ready and it’s a gorgeous walk along boardwalks to get there. The resort is laid out beautifully & it’s better than in the website photos. It seems bigger, greener & prettier. Our 2 bedroom apartment was huge, spotless, completely modern & gorgeous. We are right by the pool which is great. The apartments are such a good size for a family & they always have everything we need. We’ve already seen a sign for $1 all you can eat pancakes for kids every morning so our kids a looking forward to that. So first things first for the kids was to get into the pool. It’s a gorgeous, huge, warm pool with lounges all around, a swim up bar, a waterfall and the restaurant right there which is open & spacious. And there’s a tempting Day Spa behind it. It wasn’t busy at that time of afternoon but there were people turning up to relax with a cocktail & a gorgeous surrounding. We headed into town again (5 min drive) for dinner & went to Cocos Bar & Grill, right on the Main Street. It’s one of those places that has everything – pizza, pasta, schnitzel, steak & kids meals. The beef burger I had was so tasty & all pretty well priced & it’s good for kids as they had crayons & a colouring sheet. Again – more friendly people. Finally we are back in our lovely room relaxing. The kids were exhausted & looking forward to sleeping in a hotel bed – all tucked in together. We can’t wait for tomorrow – it’s going to be a fun day of sailing & snorkelling so I will be looking forward to writing about that. The resort looks AMAZING! Enjoy!!!! You’re so right. 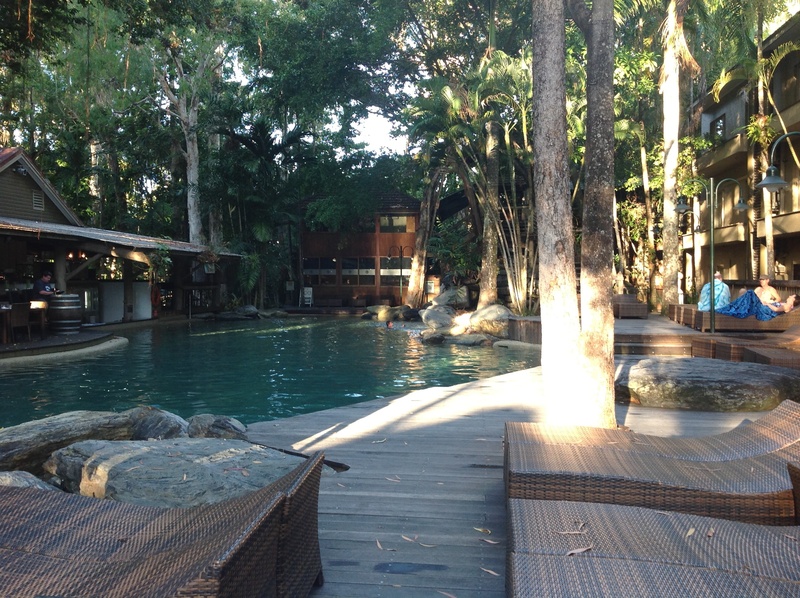 I LOVED the Port Douglas resort!